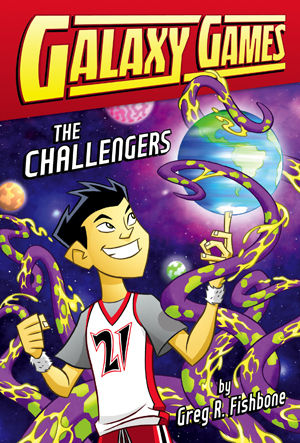 When Tyler Sato turns 11, his cousins in Tokyo have a star named after him, but it soon becomes clear that TY SATO is no ordinary star. First, it doesn’t stay in the same place like ordinary stars do. Second, it seems to be on a collision course headed straight toward Earth. The whole of humankind believes it’s an asteroid with the potential to bring on its extinction. However, it’s really a spaceship headed up by M’Fozza, a girl alien from the planet Mrendaria. M’Fozza is headed for Earth to save the world from a dishonorable performance in the Galaxy Games, the biggest sporting event in the universe. Tyler is designated to be captain of Earth’s team and works with M’Fozza to compile a team of human children to compete. The team consists of many young, talented athletes like a Chinese gymnast training for the Olympics, a Mexican wrestler, soccer players from Brazil and Germany, and a Japanese judo champion. These kids have to figure out how to defeat a team of Ossmendians, rocklike aliens who are challenging the Earthlings. As more violence is shown in the news, it’s easy for kids to think that this is the way to solve problems. What I enjoyed about this story was the concept of solving conflict through an athletic competition — or a competition in general, rather than war. What “Challengers” shows is that there are other ways to resolve differences. Though all of the young athletes selected for the Earth team were supposed to be among the best in the world, they still had their insecurities about whether they would perform to everyone’s expectations. It shows that they’re human, which I think is good for kids to see, with all the pressures they are under now, and that they don’t have to be perfect. Since he made his Major League Baseball debut in 2001, Ichiro Suzuki has become a household name in the Pacific Northwest as one of the faces of the Seattle Mariners. But before coming to the United States, Ichiro was a baseball player in Japan who dreamed of playing in the majors. Told through a series of conversations with Narumi Komatsu, “Ichiro” is the story of how a Japanese baseball player — virtually unknown to American baseball fans — became a household name in his new home. From receiving that first glove and bat at age 3, which started it all, to the move from Japan to Seattle, Ichiro shares experiences of his lifelong love with America’s pastime. One of the things that stood out to me in the book is how much technical information there is about baseball. Komatsu demonstrates his impressive knowledge of the sport when he asks Ichiro very specific questions about batting and throwing techniques and how he had to adjust these techniques when he joined the Mariners. As someone who understands only the basics of the game, this gave me more insight into a sport that is more intricate and complicated than it looks. I enjoyed reading about the differences between Japanese and American baseball, of which there are many. Readers will be surprised to read that Ichiro had to deal with more than just a language barrier when he started with the Mariners. Ichiro also discusses his struggles with injuries and the difficulties he faced trying to get a chance to play in the United States. Through it all, it is clear that Ichiro truly loves the sport. I thought this is important for people to see, as professional athletes are more known for what they do off the field than what they do on the field. It is a good reminder that many of them are like Ichiro, someone who learned to love his sport at a young age and wants nothing more than to have the opportunity to play. When you think basketball, you tend to think of the National Basketball Association (NBA), not the Chinese Basketball Association (CBA). But one man wants to change this, starting with the Shanxi Brave Dragons. On a mission to turn around one of the worst teams in the Chinese league, owner Boss Wang hires former NBA coach Bob Weiss to teach his players American basketball during the 2008-2009 season. The moment Weiss arrives in the industrial city of Taiyuan, it is clear that his duties as head coach, or lack thereof, depend on the whims of an eccentric — some say crazy — owner. Wang wants his players to play American basketball, but he does almost everything to prevent this, including stripping Weiss of his authority so that he is just a figurehead and promoting the inexperienced assistant coach. And then there are the players themselves, a ragtag bunch assembled from throughout China, with a Taiwanese player and a few other foreign players thrown into the mix. The Brave Dragons are probably the least likely group to make it to the playoffs, or even move up to Wang’s pre-season promise of at least a 10th-place finish in an 18-team league. Somehow, through a slight change in their game and a lot of luck, the Brave Dragons show signs of improvement against all odds. This was one of my favorite things about this book because I love an underdog story. This team is the ultimate underdog. From their crazy owner and constant coaching changes, to the importing (and exporting) of former NBA players, the Brave Dragons deal with more obstacles than any team should.